The Best Pump Packages “Done For You”! Thats right! These complete Lawn Irrigation Pump packages have been thoroughly thought out – every detail! Are you looking for a reliable and efficient irrigation pump with minimal maintenance? 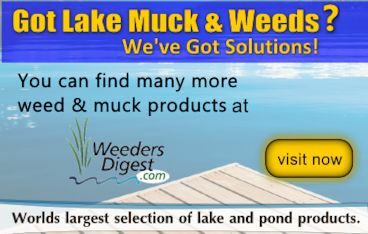 The Lake & Pond Experts at Weeders Digest offer user-friendly Pump Packages and accessories by BeachGroomer. These packages offer 1hp – 2hp motors and many accessories that provide exceptional pumping capabilities, without the typical hassles and frustrations that buyers tend to experience with other manufacturers’ products. This particular package was exclusively designed to minimize maintenance and quicken the installation process to just a few simple steps. This exceptionally durable pump package features a commercial quality Monarch lawn pump that boasts a 1 & 2 horsepower engine options. These cast iron motors are capable of pumping up to 72 gallons per minute. Monarch’s reputable quality and dedication to consistent and superior performance have driven them to become leaders of the pump industry. In addition to the remarkable pump, this package includes the state of the art Big Foot Lake Filter. This strategically designed component ensures that users are not constantly fumbling with frequent cleaning and experiencing clogged or slow pumps as a result of pesky lake debris. The filter is constructed of durable PVC and stainless steel materials so it will consistently provide extraordinary filtering over many years. To prevent excess muck, leaves, and dirt from entering the pump apparatus, the Big Foot Filter will be situated on top of a stand which elevates the mechanism off the lake bottom. The package includes the necessary tubing with attached quick connectors, 2 inch check valve, and a mounting base for the pump which secures it into the ground along the waterside. LEARN MORE or BUY the pump package here! Included pump with 1 horsepower engine. Wired for either 110 or 220 volts and capable of pumping 72 gallons per minute. Requires minimum of 20 amp supply. Engine upgrades now available in 1.5 and 2 horsepower. Pump mounting base composed of durable polyethylene provides a sturdy anchor for the pump when secured to the ground beside the water. Mounting brackets and ground stakes are also included. 33 feet of flexible and durable 2-inch hose. Composed of PVC and equipped with quick connectors not only is this hose easy to install, but it is easy to maneuver and manipulate for convenient placing. The check valve ensures that the hose and pump remain consistently full of water. This eliminates the need for priming and reduces the transmission of air bubbles. Big Foot Lake Filter which features a 40 gallon apparatus filled with pea rock for maximum and efficient filtration. Customers who choose the 2 horsepower engine should opt for the 80 gallon filter. Powder coated filter stand which offers sufficient elevation of the filter off the lake bottom. Complete Lawn Irrigation Pump or Lakeshore Utility Centrifugal Pump. The lake pump is powered by the powerful 1 h.p. Monarch Lawn Pump (other sizes available). This rugged commercial-grade cast iron pump delivers up to 72 gallons per minute. Recognized as one of the leaders in the industry, Monarch pumps have earned a reputation of reliability and quality. Also included in the pump package is the Big Foot Lake Filter. Lake filters and screens tend to become clogged if not cleaned routinely. This results in loss of pump pressure. The Big Foot’s unique design allows your pump to operate efficiently while requiring little or no cleaning. Made of heavy duty PVC plastic and stainless steel, the Big foot will give you many years of service. Also included is a durable stand to keep the Big Foot elevated from the lake bottom. You can use your pump to water the lawn or power wash your boat and dock or power the BeachGroomer. This pump can be sold as a stand alone unit wired for 110 or 220 or we can complete the system from the filter and stand to the 33′ intake hose, output valves and additional options. Lawn Irrigation Pump – Water Your Lawn or Garden from your lake or pond!